A few months back, I wrote a feature for Blood, Sweat & Cheers about a pay-what-you-can bootcamp in New York City (because not everyone who works out can afford Lululemon tops and SoulCycle spinning classes). The founder of The People’s Bootcamp, Adam Rosante, was great and answered my questions about the class with a turnaround time all writers would appreciate. 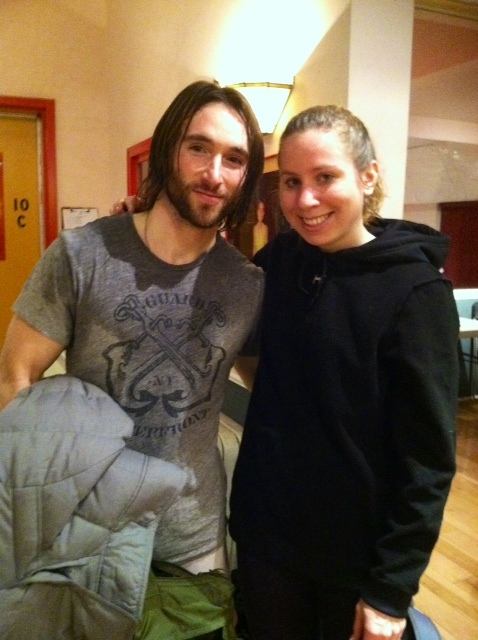 Since then, he’s helped me out with some advice on debunking common fitness myths. And just recently, in true 2013 fashion, he invited me to drop in on one of his classes one evening after work… on Twitter. Now let me tell you something: The first night I tried to make it to Adam’s class, I ended up arriving too late. Not wanting to disrupt the class, I left the building pretty defeated — I had just left work early and traveled all the way uptown, only to get right back on the subway to go home. And then, making matters worse, during my sulk I left my wallet on the subway. Thank goodness for good Samaritans: I ended up getting my wallet returned to me the next. But my point is, most people would have given up at that point. All that for a bootcamp? Most wouldn’t think it was worth it. But I follow Adam on Twitter and read his motivational fitness blog, and was determined to go back! Adam generously allowed me to reschedule, and I finally made it to a 6:30pm class last Thursday. 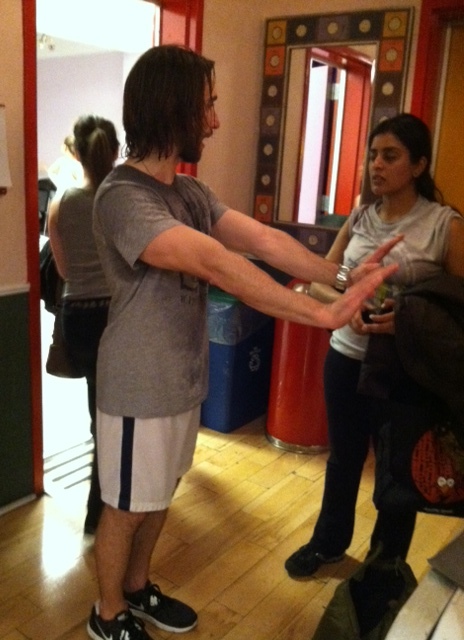 Adam’s classes take place in an open studio and use bodyweight for resistance. There’s no equipment provided or necessary—all are just reminded to bring a water bottle and a towel. About 20 or so of us spread out among the room, and we were given a rundown of the workout to come. Basically, Adam puts class goers through 7 exercise combinations that range from squat kicks, to dynamic planks, to both regular and tricep push-ups, to fancy burpees…and more. We were to do each exercise for 45 seconds, followed by a 10 minute rest, and onto the next one. Each set concluded with 45 seconds of sprinting in place. We would do a total of three sets. What we got was an invigorating, total-body workout that made me feel completely exhausted yet satisfied at the same time. At just 30 seconds into the regime, I knew it was going to be tough. I experienced several renditions of the longest 45 seconds of my life. High intensity intervals are not something I typically practice on my own, mostly because it’s easier to run or do a little yoga for an hour than to do super short, crazy intense spurts. But since each exercise was only 45 seconds, and I knew what I’d gone through to take that class, I worked as hard as I could. Adam said something during the session (besides LET’S GO, YOU GOT THIS, LET’S MOTHAF*CKING DO THIS) that really resonated with me. It was actually before the class even began. He said, “You’re doing this for you. This workout is for you — not anyone else.” Or something similar to that. But he’s right! Workouts should be for yourself – for the way it makes you feel, the way you challenge yourself, the strength you feel afterward — it shouldn’t be so you can please others or fit into society’s mold of what we should look like. It shouldn’t be for your boyfriend, or girlfriend, or revenge, or so that you “don’t feel fat.” And that’s why I like to workout. It makes me feel good. It helps me clear my head, have alone time, and let out steam every so often. So I encourage you all to workout for the right reasons. If you’re looking to challenge yourself and need to wake up your workout regime, be sure to sign up for a class with Adam. You won’t regret it! My calves were sore for days, but I don’t think I know a better feeling than one from a good workout.